North Korea, officially the Democratic People's Republic of Korea (DPRK or DPR Korea), is a country in East Asia constituting the northern part of the Korean Peninsula, with Pyongyang the capital and the largest city in the country. The name Korea is derived from Goguryeo which was one of the great powers in East Asia during its time, ruling most of the Korean Peninsula, Manchuria, parts of the Russian Far East and Inner Mongolia, under Gwanggaeto the Great. Latest news and commentary about the secretive Asian country. For decades, NATO has debated how to best balance deterrence and détente. The debate has its origins in the 1960s, as NATO adjusted to a changing world, and the Harmel Report of 1968, which argued that alliances serve both military and political purposes and must set agendas to maintain adequate defenses while promoting dialogue with the aim of resolving conflicts. NATO has also debated how to ensure that its deterrence and defense posture remains “fit for purpose” in an ever-changing security environment. NATO heads of state and government have for decades repeatedly expressed a commitment to maintain an “appropriate mix” of nuclear and non-nuclear capabilities for deterrence at the lowest levels necessary in the security environment as it exists. One interpretation of the stunning victory of Volodymyr Zelensky in the Ukraine elections is that Ukrainians are tired of serving as pawns in the New Cold War. On practically the other side of the world from Ukraine, many Koreans might justly feel the same way. While Americans frequently seem to want to divide up the world neatly into black and white camps, those on the actual front lines of these various battlefields are looking for a “third way.” They want peace and prosperity instead of perpetual and costly armed struggle that could end in a catastrophe for all concerned.Currently, practically everyone is cynical when it comes to North Korea. Grand summitry has come and gone with little to show for it, other than a few days of pageantry. Most American experts are busy piling scorn on the Trump administration for giving Pyongyang the “legitimacy” of standing next to a U.S. President on two different occasions. Still, if we are able to put quixotic notions of a complete denuclearization followed by the opening of a Trump casino and resort in Pyongyang aside, it is still necessary to consider how to stabilize the Korean Peninsula.The forbidding storm clouds of a looming clash of arms must be banished for the long term, allowing Northeast Asia its full measure of wealth and deserved harmony. To that end, it is worth taking a serious interest in the meeting that will take place in Vladivostok over the next couple of days between Russian president Vladimir Putin and North Korean president Kim Jong-un. North Korea is using cryptocurrency to evade sanctions and fund the development of nuclear weapons, according to a new study. Researchers at the Royal United Services Institute (RUSI) revealed how the exploitation of bitcoin and other cryptocurrencies through cyber crime activities offer a "financial lifeline" to North Korea as it seeks to develop its weapons of mass destruction (WMD) program. Kayla Izenman, a research analyst who co-authored the paper for the defence and security think tank, said cryptocurrency's borderless nature made it an attractive target for actors aiming to circumvent the traditional financial system. It's going to be a warm and breezy Easter Sunday. Click here for the latest river levels for the Mississippi River. Submarines are a critical asset for Taiwan’s Navy, the Republic of China Navy (ROCN). They provide critical intelligence gathering, patrol, and deterrence capabilities in the Taiwan Strait. However, they are few in number. The ROCN only operates four submarines, only two of which are used operationally.Pressure by the People’s Republic of China on would-be exporters has prevented Taiwan from buying full submarines abroad, so Taiwan has started its own indigenous submarine program. 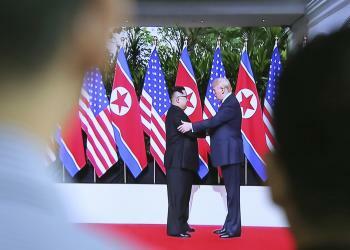 This program has attracted the usual European and American partnerships, but some other nations appear to have thrown their hat into the ring.Surprisingly, North Korea is one of these nations. It was recently reported in various Taiwanese media outlets that North Korea and Taiwan discussed the transfer of North Korean submarine technology to Taiwan. According to one account, the attempted transfer was facilitated by the North Korean Central Military Commission. The commission asked senior figures in North Korea if export was acceptable. Leadership concluded that Taiwan was not actively hostile towards North Korea and relations were cordial enough, so the export was approved.